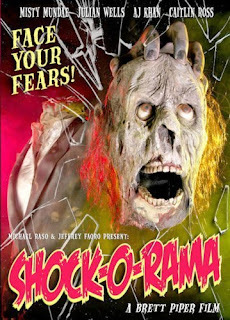 Brett Piper's 'SHOCK-O-RAMA' takes on the anthology film format made famous by Amicus, 'TWILIGHT ZONE: THE MOVIE' and others with mixed results. Popular horror actress Rebecca Raven (Misty Mundae) becomes disillusioned with her life as a scream queen and wants to be taken seriously as an actress. After making the studio lots of money they get rid of her due to her lack of chest ornaments and her age so she settles for a 2 week vacation away from everything. This is what forms our wraparound story for this anthology as we see her throughout bring the dead back to life and struggle within herself to find the real her and fight for survival against the undead. Meanwhile the head honcho at the studio and his assistance go through tapes of other actresses to see who they can get into take over the role of Rebecca Raven. Our first story is centered in a scrapyard where Jedd Callahan (Rob Monkiewicz) fights with little green men as their ship has crash landed right in the middle of his scrapyard. Joining him in this fight against very small aliens is his ex girlfriend that proves even more to her that wherever Jedd goes trouble is sure to follow. This is the most heavy on Piper's love for sfx as the aliens and their creation make for exciting viewing for fans of Piper-Mation it also my favourite story of the whole film. The final story features A.J. Khan and Julian Wells in a lovecraftian terror of sorts with a gothic theme. In a research lab girls are put through a series of tests to see how their brain reacts in REM. What these girls don't realise is that their dreams are being manipulated by Julian Wells's character and something out of this world. A.J. Khan's character becomes aware that her sexual dreams are very familiar to what the other girls have been dreaming of and confronts the good doctor and her cohort in a battle that will leave you filled with nostalgia. As mentioned at the beginning of this review this anthology film has its moments but thankfully it hits the spot more then it misses. Well cast throughout and with Piper's sfx pulling the whole film together its a film that any B-movie fan will enjoy alongside his other works. Oh and for those worried that Misty doesn't get naked don't worry about that as she bares plenty of skin in this one. As is the case with every anthology film if you don't like one part something will come along to wet your appetite later.